Looking for a Cabo San Lucas Sport Fishing Charter? Cabo San Lucas has become famous because of its recognition as the “End of the Land”, where the people that live there and the tourist, find in it a special magic energy that attracts them back again and again. Today, it’s one of the most important tourist destinations in Mexico, where important investments have been made in accommodations, golf courses, shopping centers, etc. ; making of Cabo San Lucas the ideal place for escaping of the rutinary life and enjoying the beautiful nature, exciting activities and sports or just relax on this fascinating scenario. One of the top activities, is Cabo San Lucas is Cabo San Lucas sporfishing, the species you can find here are exotic, however under the catch and release program, it seems to be more attractive to fisherman. Many locals business can set you up for Cabo San Lucas fishing charters located arroun the marina. To this incredible tourits destination you can arrive by plane, at its International airport, by bus, by car of if you prefer by Cruise Ship. 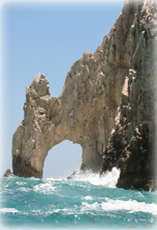 Cabo San Lucas is an important port of call for mayor cruise lines. And of course counts with modern marinas in case your traveling in your private yacht. As the “End of the Land”, at Cabo San Lucas there’s a natural rock arch formed throughout the years by erosion of water, and around it impressive rock formations stand up, which can be admire by a closer picture aboard a glass bottom boats, that can be catched at the port. As well you can spend a few hours at the Lover’s Beach or “Playa de Amor”, if the tide is low enough, located just under the arch. If you prefer to practice sports, in first place there are championship golf courses which have been designed by Jack Nicklaus and Robert Trent Jones, just to mention some of them. Most settled on a breathtaking view of the Sea of Cortez. Services are varied as we describe, shops, boutiques, travel agencies, gas stations, restaurants, nightclubs, hotels, motels, campgrounds, banks, auto car rentals, pharmacies, and a U. S. Consulate representative. Dining is one of the most outstanding standards of Mexico, Cabo San Lucas Restaurants offer the most demanding paled a experience of a life time including spectacular views and dinning water front, recommending you some places as Alexander’s Restaurants on the marina, Peacock’s, Romeo y Julieta and Mariscos Mocambo for outstanding Mexican style seafood the top Cabo San Lucas Restaurants. And at the Cabo San Lucas Nightclubs like the Squid Roe, Mango Deck Cabo beach front cantina and the Hard Rock Cafe have a lot of fun. Also at Resorts and Hotels there are Mexican Fiestas offered to their clientele. Cabo San Lucas Sport Fishing is waiting for you with an array of activities and interestings things to do, ready to make your vacation an unforgettable one. Golf:in the top Cabo San Lucas Hotels is to be practiced at the professional golf courses displayed on the seaside of the Sea o Cortez. There are several options like Cabo del Sol, Cabo Real, Cabo San Lucas Country club, El Dorado, Palmilla y San Jose. Scubadiving and Snorkeling: It’s ideal to practice these sports as Cabo San Lucas, it’s well known to divers for the abundant marine life that thrives in its nutrient rich waters. There are spots for beginners, for new divers and experienced ones. Like the underwater Sand Falls starting at the Pelican rock, the Sea Lion Colony located at Land’s end, the Blowhole located at 100 feet at caves and walls, and the Gorda bank located at 135 feet, it is recommended only for very experienced divers. Sporfishing in Cabo: is better in the summer time when you are able to catch blue or back marlin and sailfish, however the winter time also promises good catches in marlin. Dining and nightlife: is fascinating as you find a perfect place for every taste. Spa’s: located at Cabo San Lucas rival the world class spas with excellent and varied services. The following have incredible installations where you’ll relax and be pampered, Casa del Mar, Las Ventanas al Paraiso, Pueblo Bonito Rose, Villa del Palmar Beach Resort & Spa, Wentin Regina Los Cabos y Hacienda del Mar.